The history of the group starts with the Volunteer Rangers who were first formed circa 1990 to assist the then Head Ranger Geoff Solley and his 2 assistant Rangers with duties such as patrolling, work parties, led walks and events. There was an induction course at the White Rock that consisted of three Sunday mornings that covered topics such as bylaws, first aid, dealing with the public, sessions with the police and coastguards and role-play. They were then issued an ID card. There was also a uniform of polo shirts and sweatshirts with a sew on badge. The Volunteer Rangers were asked to do at least one patrol a month March to October either from 10:00 to 12:00 or 13:00 to 15:00, winter patrols were optional. These patrols started by signing on at Warren Cottage, collecting a very large radio (they did get smaller), writing down the route of the patrol in a book, reading any issues other volunteers may have had and listening to any specific things the Rangers wanted checking before heading out. On return they would note on a form any issues i.e. broken way markers, fallen branches, overgrown paths, flowering plants etc. Other activities included a Christmas gathering and some years even a float in the Carnival. Over the years the role of the Volunteer Rangers changed slowly, the induction courses were dropped and so was patrolling although we would always report issues we saw that needed attention whilst out for a walk anyway and still do so. 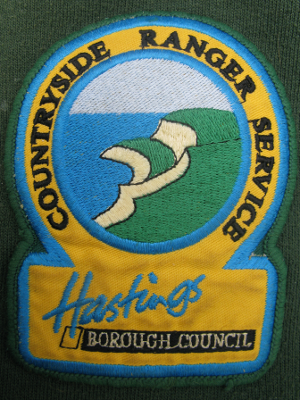 The Volunteer Rangers were officially disbanded in 2007 to make way for a “friends group” but the first Sunday of the month “task days” remained as an informal volunteer work party and in the latter part of 2008 a mid-week day once a month on a Thursday was introduced at our request to see if there was any interest. After a very shaky start it did prove popular, so much so that in October 2011 one of the volunteers present suggested doing every Thursday to get the project on the Firehills that we were doing finished. We then went on to Saxon Pond carrying on with doing every Thursday and it stuck! As of 16th October 2015 we are going to start doing some Fridays too. We seem to have come full circle now with the introduction of our new logo’ed polo shirts and fleeces and our own identity as the “Conservation Group”. In November 2015 we were asked to become more autonomous and manage our own work programme, a challenge which we all agreed to and a lot of work went into producing a 12 month programme that we felt we could deliver whilst still being flexible to accommodate fluctuations in peoples availability. Then suddenly in May 2016 we were told that it had been decided that volunteers could not work without a ranger present and our work days were being scaled down to 10 days a year. As of November 2016 there has only been one day since then, leaving 9 more in the next 6 months, which seems unlikely. A big thank you to Ven for providing an insight into the early years.